Hervey Bay is home to a fantastic array of accommodation options to suit business travellers, singles, couples, families and groups. With accommodation to suit all tastes and budgets, Hervey Bay features economical motels, comfortable hotels, self-catering apartments and luxury resorts. Dotted throughout the main streets and esplanade, these hotels and resorts feature a range of excellent facilities which vary depending on your accommodation type but generally include swimming pools, gyms, restaurants, bars and lounges, laundry facilities, internet access, tennis courts, spas, convenience stores, conference facilities and BBQ areas. This Hervey Bay accommodation is ideal for those after self catering facilities while holidaying on the Fraser Coast. Allegra Hervey Bay features a great location close to the beach and restaurants. Guests can enjoy the use of the heated swimming pool and gym. For your next holiday to Hervey Bay whether it is for whale watching or prior to visiting Fraser Island, why not stay at Allegra Hervey Bay? BreakFree Great Sandy Straits is located in the aquatic playground of Hervey Bay, offering uninterrupted views of the Bay and Marina from sunrise to sunset. Choose from a studio, 1, 2 or 3 bedroom apartment, each featuring a large balcony overlooking the marina or beach. Hervey Bay is a wildlife mecca from the humpback whales sighted between July and November to turtles, dolphins and dugongs. Visit Fraser Island, or simply stay in Hervey Bay and enjoy the unique shopping, great eateries and coffee shops. Set amongst 20 acres of lush tropical gardens, Kondari Hotel offers you the perfect environment in which to relax and unwind. Featuring a natural lagoon with abundant wildlife Kondari Hotel offers a unique holiday experience. With two styles of accommodation, Kondari Hotel will suit your every need. Whether you are enjoying a romantic escape, a break with your family or are traveling on business, Kondari Hotel has it all! 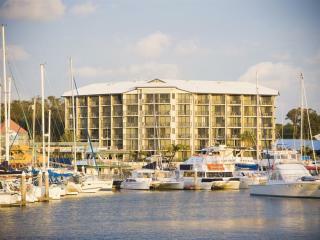 Mantra Hervey Bay is ideally located on absolute waterfront at the marina in Hervey Bay. The complex rises to 6 storeys and all hotel rooms and 1, 2 and 3 bedroom apartments have spectacular views of the Great Sandy Strait Marina. Facilities include a swimming pool, sauna, exercise room, BBQ facilities and adjoining restaurants. Mantra Hervey Bay is perfectly positioned to take advantage of the best of the amenities and activities that Hervey Bay has to offer. Located 3 hours drive north of Brisbane in Hervey Bay, Oceans Resort & Spa Hervey Bay is situated on the Esplanade opposite Urangan Beach and its famous pier. Most suites at Oceans Resort & Spa Hervey Bay have unrestricted water views of the bay and Fraser Island. Oceans Resort & Spa Hervey Bay features a landscaped lagoon swimming pool and lap pool, fine dining restaurant and cafe, and a health club offering a range of massage and beauty therapies for pampering and relaxation. This Hervey Bay accommodation offers the perfect location not far from the marina and Esplanade. Ramada Resort by Wyndham Hervey Bay features studio and 1 bedroom suites suitable for couples and small families heading to the Fraser Coast for a holiday or just for a one night stopover. The resort offers facilities including two swimming pools, bike hire, car parking, a restaurant, gym and BBQ area. The Bay Apartments are located on the Esplanade at Scarness in Hervey Bay, straight across the road from the beach, and within walking distance of many cafes, bars and restaurants. Guests can choose from 1, 2 & 3 bedroom self contained apartments with spectacular northerly ocean views. The facilities included a heated lap pool, spa, sauna, tennis court and gym.